Which bust (so far) will turn it around the rest of the way? ASK THE EXPERTS appears weekly from training camp through the Super Bowl with answers to a new question being posted Thursday morning. How the guest experts responded when we asked them: Which fantasy bust (so far) will turn things around the rest of the way? Duke Johnson will continue to see an increased role for his team moving forward. He will become a solid flex option most weeks with the team trailing in most games. It was just one game, and it came in a positive matchup for wide receiver scoring. But I’m ready to believe that the Cowboys can support Amari Cooper as a regular WR3, which would be an improvement over the way we started this season. Cooper drew 5 first-half targets against Tennessee, when no other Cowboy besides Ezekiel Elliott topped 2. Cooper was the guy on the 1st TD play of the game. And now Dallas gets the league’s most favorable remaining schedule for wide receiver scoring, according to the adjusted fantasy points allowed formula on DraftSharks.com. Have to like Leonard Fournette who has been a no-show this year with a hamstring injury but should be good to go this week with their Week 9 bye over. The Jaguars have Carlos Hyde and he will be involved, but Fournette will remain the primary back and make up for lost time. Duke Johnson was a prized draft choice in August, but he has been a huge disappointment since then. With new HC Greg Williams touting his talent, look for him to rebound over the rest of the season. He went from 6.30 and 3.60 points in Weeks 7 and 8 to 29.60 points last week. With 9 receptions, 86 combined yards and 2 touchdowns, we saw what Johnson can do for the first time in a long time. He is now a low RB2/high RB3 that you can count on in your injury-ravaged lineup. OK here is a bit of a reach but let's go with D'Onta Foreman. Without a doubt a bust as he has not played a snap since Week 11 of 2017 when he went down with a torn Achilles tendon. The Texans have a bye this week and Foreman is eligible to start practicing now. Lamar Miller has done well but he and Alfred Blue struggled Sunday against Denver. The window of opportunity could be there for the fresh legs of Foreman to make a difference in the last half of the season. Hendricks is the author of Fantasy Football Guidebook, Fantasy Football Tips and Fantasy Football Basics, all available at ExtraPointPress.com, at all major bookstores, and at Amazon and BN.com. He is a 25-year fantasy football veteran who participates in the National Fantasy Football Championship (NFFC) and finished 7th and 16th overall in the 2008 and 2009 Fantasy Football Players Championship (FFPC). 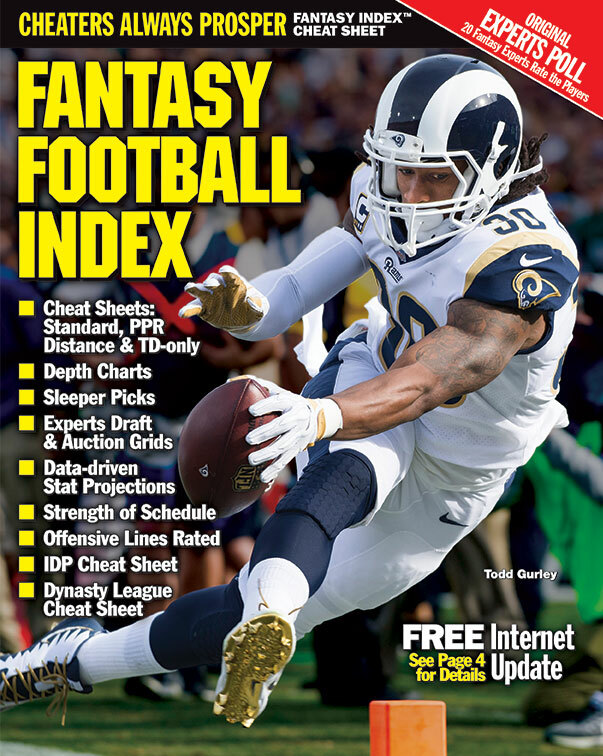 He won the Fantasy Index Open in 2013. Follow him at his web site, www.ffguidebook.com. I'm all in on David Johnson. The coordinator switch should help, and so should the matchups. Johnson faces a soft Kansas City run defense this week, followed by a phoning it in (and terrible) Raiders defense next week. He gets Green Bay, Detroit and Atlanta in Weeks 13-15, and they can't stop the run either.